With the popularity of Amiibo figures, it was only a matter of time before other companies followed suit. Gamestop saw the profit in this and with their “ThinkGeek” brand made their own line of exclusive, “Amiibo-ish”, non-electronic figures called Totaku. They don’t interact with your games in any way, they just look pretty on a shelf and they have a plus-shaped base that allows you to connect the bases together for a nice display. It’s a neat way to get non-Nintendo figurines to stand side by side with your Amiibo ones. There are many characters in the line-up including Crash Bandicoot, Spyro, Parappa the Rapper, Sackboy, Lara Croft, Kratos and many others. But of course, I’ll be focusing on the classic Sonic trio recently released. Sonic, Tails and Knuckles are all here in their classic glory. Each one with their own fine details. I’ll be going over each one individually. Sonic has his old finger waving pose with a 16-bit ring laying at his feet. There’s striped grass at the base with the checkerboard dirt underneath showing that he’s standing in the Green Hill Zone. This is the same for all three figures. The paint job is fairly well done with a few very tiny blemishes here and there. For instance, the white of the eyes bleed a tiny bit into the muzzle, but only if you’re looking at it from an upper angle. 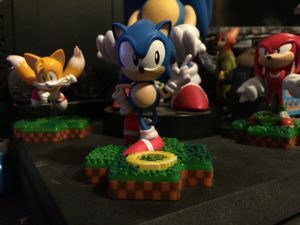 It’s a common flaw in Sonic figures. The ring has several different pixelated levels of colors to make it as exact to it’s game counterpart as possible which is a very nice touch. Here he comes! Rougher than the rest of them! 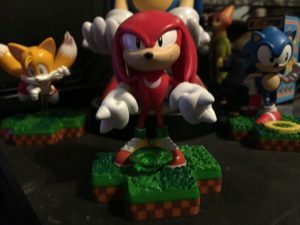 While he’s not guarding the master emerald, Knuckles is standing over a green chaos emerald. He’s got a cute smirk on his face and looks like he’s ready to enjoy a good fight at a moment’s notice. This is a real solid figure with no paint blemishes at all. Probably my favorite of the bunch. Last but not least, Tails is seen flying just above the striped grass. Shown in a pose that says he’s ready to go and an adorable smile on his face, Tails paint job is also flawless. The only downside to this figure is that he has no extra object on his base. 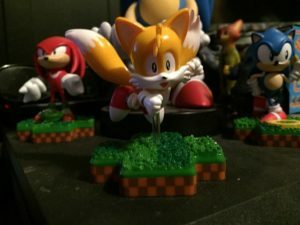 No ring, no emerald, just Tails. Overall this figure set looks great. With the plus-shaped bases and striped grass, you can make a nice display that connects the three figures together. $10 American each isn’t too much for these quality figures. They also make a nice gift for the holidays. You can pick them up at Gamestop in the US, EB Games in Canada or GAME in the UK. < Previous Post Previous post: Clean Footage of SegaSonic Bros Emerges! Next Post > Next post: Sonic Movie Teaser Shown To CCXP In Brazil!